Historically accurate and expertly crafted to the highest possible standard, this Authentic Medieval Leather Money Pouch is perfectly equipped to complement and enhance a diverse range of Renaissance, Larp, and fantasy costumes. 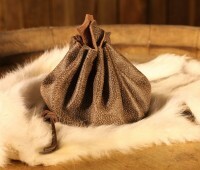 Made from genuine leather, this small yet spacious drawstring moneybag is sure to become a welcomed addition to your Larp wardrobe. Ideal for carrying money and other small objects, this money pouch is also ideal for adding yet another authentic dimension to any Larp costume. Available in a variety of rich colour ways, this money pouch is 9cm in height and 7cm in diameter.